If you are like me, you enjoy making gifts for the holidays. But unless you planned WAY ahead, you probably don’t have ready-made gifts sitting on the shelf. And there are only a few weeks left! A homemade fruit liqueur is just an infused spirit (vodka, brandy or gin) that is sweetened. It is delicious and quite simple to make. But…with only a few weeks until the holidays, I am giving you an accelerated method below. You make the liqueur in half the time. AND you have a better, deeper flavor in the finished product. Here’s the scoop on how it’s done. Why Frozen or Crushed Fruit? When you freeze fruit, the cells rupture. That is why when you defrost that fruit, it is mushy and gives off more of its juice. 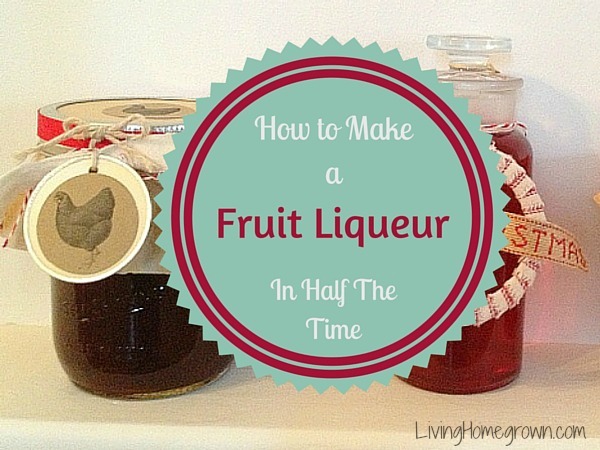 This is a benefit when making homemade fruit liqueur. In the summer months, you can use fresh, in-season fruit. And you can get the same effect by crushing the fruit before adding the spirit. Either way, you get more juice (and flavor) in the finished liqueur. Most homemade liqueur recipes tell you to steep a batch of fruit for weeks or even months. And this is how I made liqueurs myself for many, many years. But then I discovered a local restaurant that makes their Wild Blackberry Liqueur by steeping for a week, straining and then adding more fresh fruit and steeping again. The result was a much more concentrated flavor. If you have the time, then you can do this same method to get a rich flavor. But when pressed for time (like now), you can do two (3-day) steepings and still get a nicely flavored brew. You have a delicious infusion in just 6-7 days that is better than one steeping for a week. The down side is that this uses up twice the fruit. But if you have grown the fruit yourself or you are using locally-sourced fruit that you froze during the summer months, the cost is minimal. The sweetener is what changes this recipe from just an infused spirit (which is a delicious ingredient in cocktails) to a liqueur (which can be used in cocktails OR sipped on its own). By adding a sugar syrup, you are making the infusion more versatile. Most recipes will tell you to add a 1:1 sugar syrup – which is one part sugar to one part water. And there is nothing wrong with that. However, you can use a more concentrated sugar syrup 2:1 or even 3:1 and you end up adding LESS syrup and that makes the resulting liqueur less diluted. In other words…You get a slightly stronger fruit flavor in the liqueur because it is more concentrated. My suggestion is to start with one of the heavy syrups described below and when it is cooled to room temperature, add just a 1/4 cup to your brew. Stir, taste and see if it is sweet enough. You can always add more, but you can’t take it out. Once you have the desired sweetness, you can bottle up your finished liqueur for gift giving. How do you make a 2:1 syrup? Well, you could make it with 2 cups sugar and 1 cup water. But that would probably be more than you need. Full instructions are in the PDF below. How do you make a 3:1 syrup? Again, you could make 3 cups sugar with 1 cup water. But that would be too much. This accelerated method works best with berries: strawberries, blueberries, blackberries, raspberries, etc. Cranberries do not work well with the fast method because they do not give up their juices as quickly. But you can certainly make cranberry liqueur by steeping for 1-2 weeks, straining and then doing a double steeping for another 1-2 weeks. I think Vodka works best for berry liqueurs. I save Brandy for summer steeping of peaches or plums. Gin is okay, but not my favorite. Other spirits such as Everclear (grain alcohol), tequila, etc will work but have a very strong flavor on their own. For delicate flavors such as berries, I find Vodka works the best. You do NOT need to buy an expensive spirit. Medium to low-priced brands work fine. There are no set measurements. Simply place the fruit in a class container, pour in enough spirit to cover the fruit (it is okay if it floats), cover and steep. Once you finish making your fruit liqueur, spend a little time with the packaging. You can find inexpensive bottles at the Goodwill, or you can order bottles* online (if you want to get fancy). Or you can give smaller bottles* and include an inexpensive cocktail shaker*. Be creative! Check out Pinterest for packaging ideas. Don’t want to buy new bottles? No problem. You can just use a canning jar and call it “Moonshine“. Have you ever made your own liqueur? Are you making any this year? Note: This recipe was also discussed in my latest podcast. If you would prefer to listen rather than read, you can check out the show notes for Episode 33. I love your site! I have a question about your accelerated liqueur recipe; do you defrost the frozen fruit first? Or does it matter? Thank you. No, it does not matter if the fruit is still frozen when you start. Just put it into the container frozen and go from there. Easy! Sounds good Laurette! Let me know how you like the heavier sugar syrup when you are done. I’ve done raspberries in vodka and peaches in brandy (and was gifted cherry liqueur), but only in the summer—and not the double steeping method. Enjoyed your article about making an adult beverage. Have you tried making fruit ‘Shrubs?’ Recipes are very similar. One cup of fruit, one cup of sugar to macerate, a little time in the refrigerator, add a cup of vinegar and you are ready to go, strain if you wish). A splash of seltzer water, a little bourbon (or the beverage of your choice to mix) and kick back and enjoy God’s goodness. I have tried shrubs! They are delish. I like your recipe though. It sounds like the perfect formula that would work for many different types of fruit. I like this idea. Maybe a stupid question but can you do anything with the fruit after you’ve steeped it? I don’t throw away the drunken fruit. Save it and freeze it for later. It will be mushy, but still has a lot of flavor. It can be pureed into a grown-up sauce for desserts or used as a cocktail mix. When you are ready, you just defrost and puree it. If it is a fruit with seeds, you might want to run it through a sieve or food mill first to remove the seeds. It is always yummy. This is long time after you did the podcast but I just recently discovered you. I made a rasberry fruit liquor using your instructions for making in half the time. I steeped the berries, strained then steeped new ones, strained and added the sugar syrup. It was so delicious. It was amazing! I put it in a jar in my cupboard and a month later I tried it again and its tasting kind of vinegary. It was so good when i first made it. I think it is fermenting. Should I have refridgerated it? I used vodka. Can I somehow fix it to taste good again? Maybe steep another bag of rasberries in it again? Or do I have to throw it out? Please help.